New Hampshire children, from preschool to third grade, will select the winning picture book when they vote in November 2019. The deadline for sending in votes will be Friday, December 13, 2019 at 4:30pm. Materials for the 2019 Ladybug Picture Book Award will be published in July 2019. Please take the Ladybug Feedback Survey before May 25th to help us plan for 2019 materials. Resource info on each book will be published every Friday throughout the summer at Book Notes. The Ladybug Picture Book Award is designed to promote early literacy and honor the best in recent children's picture books. A committee of children's librarians from around the state selects 10 picture book titles each spring. Then, during November, New Hampshire children from preschoolers to those in third grade choose the award winner. The winning picture book is announced at the end of the year. 2016 Ladybug Picture Book Award went to It’s Only Stanley by Jon Agee. 2015 Ladybug Picture Book Award went to The Day the Crayons Quit written by Drew Daywalt and illustrated by Oliver Jeffers. 2014 Ladybug Picture Book Award went to If I Built a House by Chris Van Dusen. 2013 Ladybug Picture Book Award went to Little Dog Lost: The True Story of a Brave Dog Named Baltic by Mônica Carnesi. 2012 Ladybug Picture Book Award went to Pete the Cat: I Love My White Shoes written by Eric Litwin with art by James Dean. 2011 Ladybug Picture Book Award went to Memoirs of a Goldfish written by Devin Scillian and illustrated by Tim Bowers. 2010 Ladybug Picture Book Award went to Princess Hyacinth (the Surprising Story of a Girl Who Floated) by Florence Parry Heide and illustrated by Lane Smith. 2009 Ladybug Picture Book Award went to Waking Beauty by Leah Wilcox and illustrated by Lydia Monks. 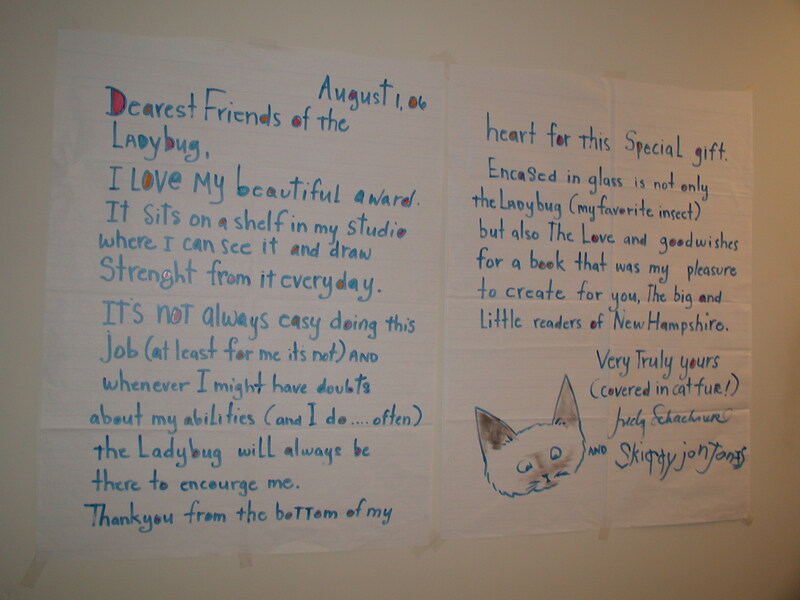 2005 Ladybug Picture Book Award went to Judy Schachner's Skippyjon Jones. Read the beautiful thank you note we got from them. 2004 Ladybug Picture Book Award went to Keiko Kasza's My Lucky Day. 2003 Ladybug Picture Book Award went to Kate & Jim McMullen's I Stink! For more information, please contact Mary Russell.